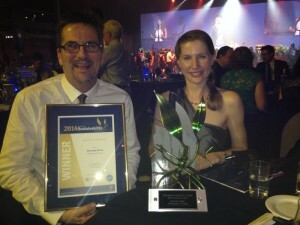 Ecolateral was honoured on Friday night for its work on the Beachmere Project for Sovereign Homes. The project was awarded the 2014 Premiers Sustainability Award for the Built Environment . In winning this award the project edged out some impressive competition including Norman, Disney and Young’s 247 Adelaide Street project and Arup’s Global Change Institute project at University of Queensland St Lucia campus. Our client deserves this high level of recognition given his unrelenting commitment to getting a cutting edge environmental outcome for the Beachmere Project. Ecolateral was involved from day one in providing initial design critiques and then a full auditing and verification service throughout the detailed design and construction phases.